"My idea is to build "neighborhoods" where houses arranged in a ring would have metro access from their basements- if you want to get to the downtown area, you simply go down the stairs/ladder and hit the tracks. These neighborhoods would not be connected by road to the city center or other neighborhoods, instead giving them a greenbelt where trees and farms can be grown up for harvesting at will and nature is preserved. Only the city center would be connected to other towns by road and rail. Each neighborhood would contain eight plots, each with the basement already dug, but that's all. They'd be arranged in a box pattern with the center of the ring being open space, maybe for a public storehouse. City growth would, therefore, not be limited by road expansion and poor planning. Each time a neighborhood is filled, rather than expanding the neighborhood, a new neighborhood is built elsewhere and linked to the downtown hub by metro. Only downtown would be able to expand like a traditional town." Plots will be 16x16, but the city center will feature Segasaturn95's flexible plot design, in which multiple bordering plots can be given for a maximum plot size of 32x32. Metro stations in neighborhoods could be built above or below ground, so long as all residents can access it and the neighborhoods are limited to 8 plots. Metro lines will be built more shallow than intercity lines, and will rise to the surface to become elevated rails while passing through the greenbelt. Neighborhood plots can be given to anyone. City center plots must be given by an Officer. Farming will not be allowed near the city center. The city center will be built in a valley, preferably near Birch or Pine Trees. Citizens will be called "Topazers"
Other ideas included the design of the central station, which involves a CARTS system built by WaterSlide, and a 3-dimensional map built at a 1/16 scale, made of wool, proposed by totemo, who originally used the idea for Eastgate on PVE5. The well-laid plans quickly fell apart as the server was reopened on PVE6. Although the hub location was secured and had plenty of available flat land, it was covered in snow, something Segasaturn95 was not prepared for. Progress was major at first, with the rail station completed within a few days. However, a second rail project, the Y70 rail, was built from a station nearby, which partially negated the hub station's usefulness. Road building and land clearance was the next priority, but, infuriatingly, the project slowed to a crawl as no assistance was found during the first week, as Wessmwatson had decided to build a freelance project instead. Alone, Segasaturn95 completed the city hall, a public mine and storage building, and three separate farm buildings before nearly quitting during mid-December. After pleas from other city-leaders to stay, Segasaturn95 agreed to continue work with imwoood as a second town leader. Together, they began work on entering the city into FISA, with the construction of a massive spleef arena near the town center, known as Topaz Arena. Nearly nothing remains of the original plans as the city continues to struggle. Segasaturn95 heads up the government of Topaz, acting as Despot. imwoood is an Officer of the town, but is equal in authority to Segasaturn95. Bathacker is also an officer of the town, but is lower in rank than the former two. A new Officer will be appointed for every ten residents in the city. The job of the Officers will be to enforce the town rules. Officers can also be given extra titles, which don't increase their authority, but instead outline their area of business regarding the town, so that policy questions are directed to the people who care about them. Segasaturn95 is the lead of the project, he has the final word. Topazers will respect the authority of the Officers, and will not ask other officers to contradict policy decisions. They may ask Segasaturn95 to review the situation. Roads must be built to be 4 blocks wide- two half blocks in the center, framed by a stair block at each side. There is not restriction on the material used in this fashion. Buildings must leave a strip of grass around their outer edge. 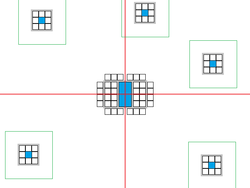 Buildings built on a 16x16 plot can only have a 14x14 floor plan, and 32x32 plot buildings can only have a 30x30 floor plan. If dogs are still allowed on the server, you are allowed to keep exactly one dog in your home. This does not apply if you are living as a tenant in another Topazer's building, in which case he/she decides whether or not you may keep one dog. Kennals are allowed to be built in the city center only. Mines must be pre-approved by an officer! Do not dig more than one basement level for your home. Monkeh Island @ ?, ? This page was last modified on 7 February 2012, at 03:43.